Zipcar and Uber are both very innovative companies that, at least in part, appeal to the same customer and offer similar customer value propositions. Today, we are going to compare their business models. To start with the confusing part first, both can be categorised into more than one business model. Zipcar falls under the Pay-per-use business models often also called “On-demand” business models. Both are very similar though not exactly the same. 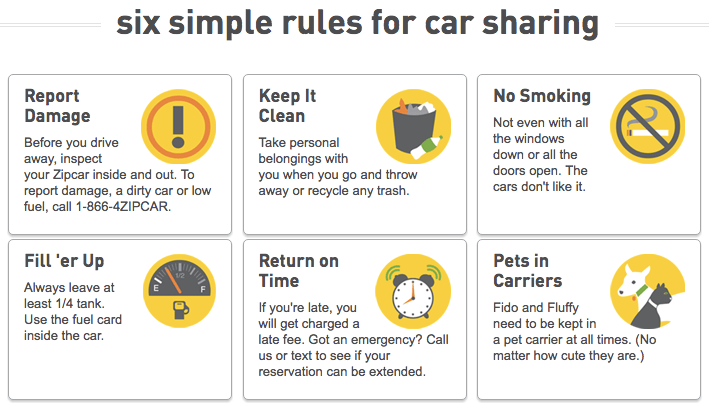 And if that is not confusing, Zipcar also considered part of the sharing economy by some. Uber, on the other side, uses a platform business model (and there is no differing view here, phew). But this would be too easy! The differing views are on whether or not they are also part of the sharing economy. Many experts as well as most of the media consider Uber part of this socio-economic trend (the sharing economy) and so do I. If you don’t worry to much about terminology (and I recommend you don’t), then you can move onto the easier task. And that is actually the comparison of their business models on a more detailed level. Both business models are based on economic benefits. 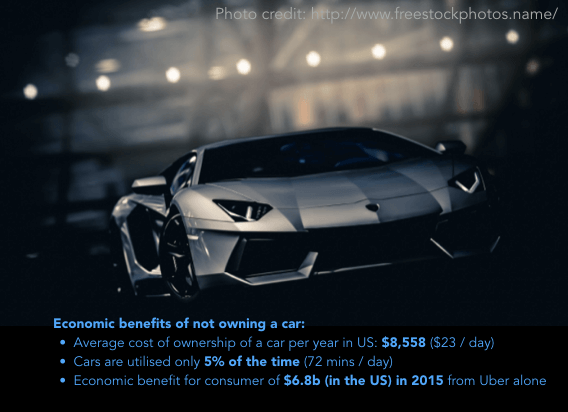 And these benefits are based on the fact that the users save buying, operating and maintaining an expensive asset: a car. It is beneficial especially for those who would use their cars infrequently. Regardless which way you measure, it seems cars are parked roughly 95% of the time. Add to this the fact that it costs an average of $8,558 per year to own a car in the U.S.
Peter Cohen, et al. state “using almost 50 million individual level observations and a regression discontinuity design, we estimate that in 2015 the UberX service generated about $2.9 billion in consumer surplus in the four U.S. cities included in our analysis.” This is for the four cities of Chicago, Los Angeles, New York, and San Francisco. Based on this they estimate a consumer surplus (=economic benefits) of $6.8 for the US in 2015 alone. There are differences in the management of assets between Zipcar and Uber. Zipcar owns the products/services that they provide, Uber does not. This is significant in a number of ways. Zipcar has to manage the operational aspects of the provided asset/product/service themselves. They do so by pushing the accountability for the more frequent tasks to the user where possible and by assuming responsibility for the less frequent, more specialised tasks themselves. Zipcar moves the responsibility for fuelling the car to the user; same with keeping the car clean. But they are responsible themselves for getting the maintenance conducted. Take as an example getting the car serviced at the right intervals. Uber and Airbnb go one step further. They push this task to the owner of the asset. Thus, they incur no costs in relation to the fuel, the act of fuelling, maintenance, cleaning, etc. They rely on the fact that if a car looks very messy or unsafe, e.g. due to unrepaired damages, the customer will either complain or give the driver a bad rating after the ride. Airbnb relies on similar mechanisms. Further on they foster a community and award “super hosts” – those hosts who get repeat great ratings/feedback. I have covered Airbnb at great detail here using the business model canvas (and Uber here). You might say that Zipcar passes all these costs onto the user anyway. But the whole point is that this makes Zipcar’s offering more expensive and thus less competitive. And this holds equally true if they lease the cars (which they partly do) as the cost of ownership of the car for the respective portion of its lifecycle will be pushed to Zipcar in any case. Both, the sharing economy firms as well as the on-demand companies need to find cost-effective ways to distribute their product or service. Zipcar locates their cars in the neighbourhood of uni campuses close to one of their target users, being students. Their cars are located in fixed parking spots which can be looked up via the Zipcar app or on their web pages. This is a significant improvement compared to the classical car renting models who are mainly based somewhere near airports, making pick-up and drop-off a prohibitive effort to start with. With Zipcar, there is still some effort involved for the user in bridging the “last mile.” This is true for many of the on-demand, platform business models and sharing economy companies where tangible goods are involved. E.g. if I want to borrow a drill, camping equipment or a lawnmower, I have to go and pick it up and return it. Uber offers the convenience of the car coming to you, i.e. has zero cost of distributing the asset or service. Both the on-demand as well as the platform businesses must minimise transaction costs at least for the frequent transactions. “I would never be able to provide you a car for an hour if the transaction cost was anything” Robin Chase, former CEO and co-founder Zipcar. 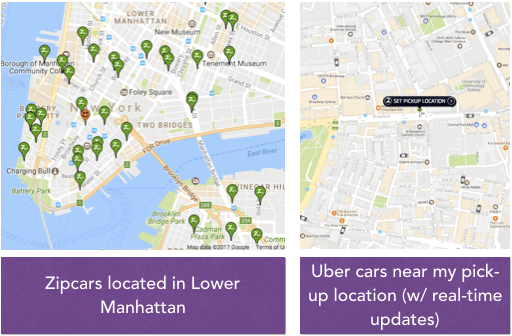 Both, Zipcar as well as Uber use technology instead of humans for coordination tasks. When in the past taxi companies had a phone operator and a base, these overhead/admin costs have now been eliminated along with many other costs. Uber brings two parties (often peers) in touch while providing clear guidelines on their interactions. Where necessary they will need to have an arbitration process. Zipcar doesn’t bring peers in touch as they own the product/service themselves. Nevertheless, they both have to keep transactions lean. Trust is important for any company. But it is more important for newer and less known companies. This affects all areas of the business, starting from making business with them to feeling comfortable with the offering. This may be equally stated about any country. But having to run TV commercials (or other expensive forms of ads) is exactly that: an expensive way to be trusted. And it may not work for many young companies. You can imagine how steep the trust barrier would be if the payments had to be conducted between peers. Sharing economy companies do not use any cash payments nor peer-to-peer payments. All payments directly go to the company. Depending on the type of business many other safety measures are being put in place. Both Zipcar and Uber have requirements to the age and inspections of their vehicles. Uber additionally has to put checks into place regarding the driver (driving history, criminal background, etc). Similar considerations apply t0 the liability and insurance. Zipcar, as well as Uber, have their insurances covering a range of accidents but of course, there will always be those tricky ones that one ever thinks of. In any case provision of some insurance for the most anticipated case is a basic expectation. For Uber, there are additional challenges on this to ensure driver and rider safety. This applies to all sharing economy companies to a varying degree. As many of them enable peer-to-peer transactions, the company has a responsibility to manage the risks that can occur during (and even after) those human interactions. 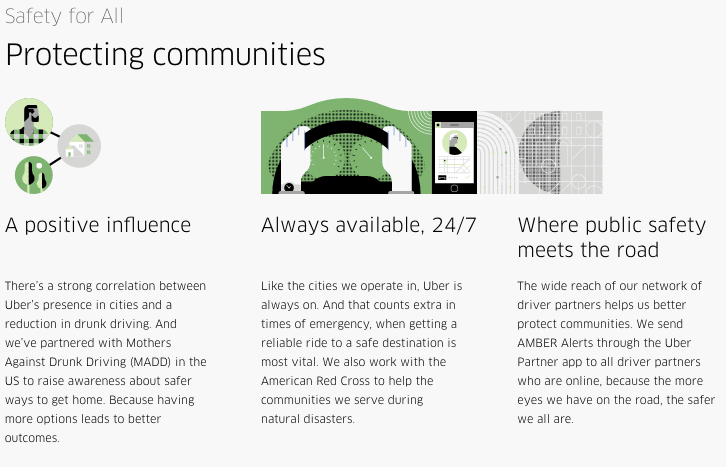 Uber aspires to go beyond just driver and rider safety by doing stuff for the community. Pay-per-use companies own the assets (or services) that they provide. It means they have direct influence over its condition. Platform businesses do less so. If it is a neighbourhood good that you borrow from someone or take a ride with an Uber driver, the condition of the asset (drill, mower or car) is managed by the owner. Zipcar owns various types of cars. But they select the vehicles types that a being added to their fleet. They seem to be increasingly distinguishing between those types which they provide to students (located near campuses) and those they offer to businesses (located near CBDs and airports). Uber takes a different approach partly because they don’t have control over the asset. And partly because it may be a great system. The quality/experience of the actual ride is rated by the passenger (btw the driver can also rate the rider – a little-known fact). Uber leaves it to the feedback mechanism to weed out offenders of the actual (as opposed to the assumed) experience of their customer. To many people, the interaction with the driver may be more important than the size or brand of the car. And on top, this might be quite different in different countries. Why would we assume that the customer experience or quality expectations are the same in New Delhi as they are in New York? I have shared the business model compass created by Boyd Cohen before. It is a useful tool in determining if you are more a “commons sharing” business or a “market sharing” business. Commons sharing businesses embody more the original idea of the sharing economy which is about community, empowered people, etc. Market sharing businesses are mostly profit-orientated. If you are the latter, do not pretend to be the former. You would simply be fighting a forever uphill battle. You still need to care about your footprint and claim credit for the good things you do but don’t state that it is your (only) mission. 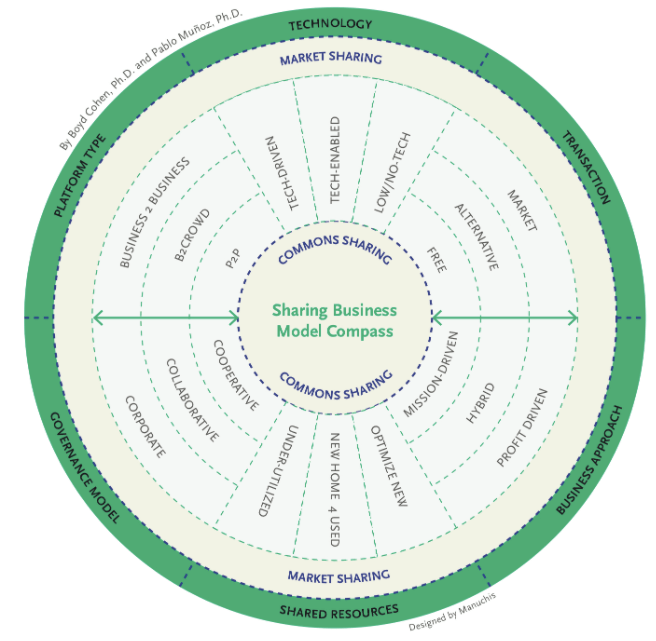 The sharing business model compass can help with elaborating your business model. Are you a marketplace? How are you bringing demand and supply together? Are you for profit or mission driven? Are you a corporate-driven or a collaboratively governed business? Are you peer-to-peer (Uber), business-to-business (Hilti), business-to-crowd (Kickstarter)? Because on-demand companies own the assets that they provide, this somewhat limits the pace of their growth. A large share of their capital has to be invested in buying or creating those assets. Since the capital generally is provided by their investors (or bondholders) their growth is limited by investors’ risk appetite. Before committing to the next tranche of capital, investors will want to see returns on their previous investment. Platform business models are capital-light and can use more of their funding for customer acquisition, brand building and so on. Uber, for example, has used about $2b in customer acquisition in China alone. And even this was too much of an ask for their investors. Realising this is not a sustainable, they have pulled out of what once seemed to be their biggest potential market. At the end, they settled for a 20% share of the largest Chinese ride-hailing company, Didi. In any case, it is not surprising that Uber and Airbnb have a significantly faster growth trajectory than say Zipcar who are one of the most successful carsharing companies. And even if they lease their cars (which they do to a certain degree), they get to pay for the cost of ownership (depreciation, maintenance costs, etc) in the lease rates. Thus it makes no material difference to owning a car (other than possibly in the cost of capital which may be lower for the lessor than for a start-up). JVs with a manufacturer could bring capital costs down as well but it will never be close to what the Uber’s and Airbnb’s can achieve. I have covered the social impacts and regulatory implications of sharing platform businesses in great detail. These can be very profound in case of the large platforms. With on-demand businesses who own their assets and have no service component, this is quite different. 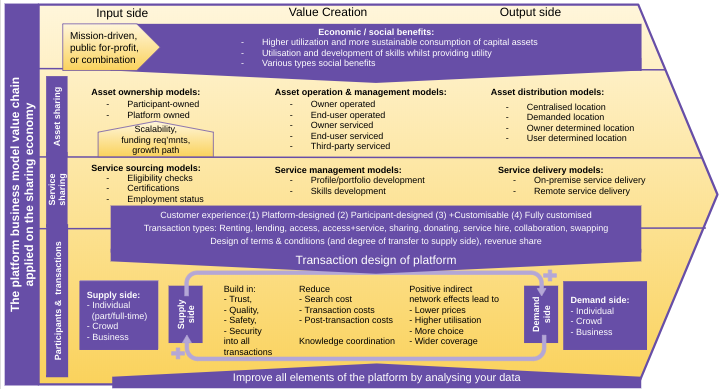 At the bottom of this article you can download the sharing platform business model value chain which shows all the considerations above (and more) in one inforgraphic. Watch out for emerging competition that uses sharing economy principles. Learn from one or hopefully more of the elements that distinguish sharing economy companies from traditional businesses. Actively expand your business to include sharing economy (or on-demand) type offerings (remember BMW and Mercedes have done so). Start-up your own sharing economy company or form a joint venture with a suitable partner. On a very basic level, which of the sharing economy elements can you get ideas from to apply to your company, department or role? 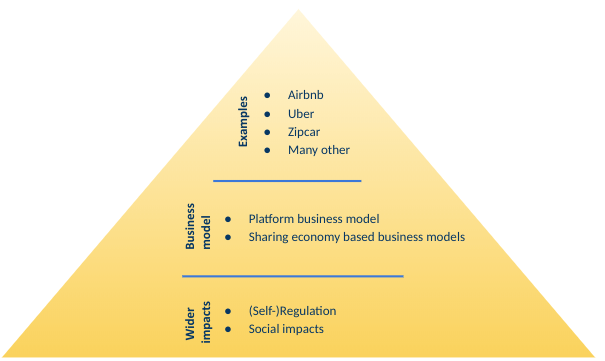 What elements of sharing economy vision could be valuable for your company? Can you apply any of the collaboratively governed mechanisms? Which economic benefits would be there if your customers were to use existing assets better? What can you learn from sharing economy’s asset management principle? Anything you can learn from sharing economy (or on-demand) businesses distribution models? Can you establish a better feedback loop on your customer’s experience?